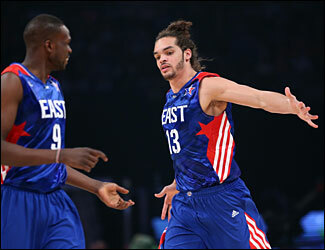 It wasn’t the block for Joakim Noah against Zach Randolph early in Sunday’s NBA All-Star Game won by the Western Conference All-Stars 143-138, or dunking that pass from LeBron James on the pick and roll, or the crossover drive for a basket, the defensive stand against eventual game MVP Chris Paul or the exasperation with the officials for not getting a foul call. Yes, in an All-Star Game. No, what really stood out Sunday for Noah, and even teammate Luol Deng who had 10 points in 17 minutes, was the smile on Noah’s face that no one could seem to wipe off. “I had a lot of fun,” said Noah. “I haven’t slept in three days. That’s for real. There’s not one of my friends who isn’t here. I got my pops here; I’m looking up (in the stands). He’s smiling and proud. It means everything to me. “Just being out there to me. It felt great,” enthused Noah. “There wasn’t a particular play. Just being able to spend some time with these guys you view as kind of like the enemy. Every summer I work out, I think of all these guys, how they’re in the way of what I want. And that’s a championship. “To be able to spend a little time and talk to them, vibe with them, check out their routines. It’s pretty interesting,” Noah said. Oh, no! Losing that edge against Kevin Garnett, who talked of enjoying his time with Noah, and James? “I’m not friends with them,” Noah corrected. “It just gives you a little more; you have to respect the game. These are the best players in the game. And with that a beaming Noah was off, the balmy Houston night no doubt lit by his brilliant smile and gregarious nature. Yes, even longtime rival Garnett got caught up a bit. Jo, Lu and KG. I’m not sure we see them partying that much, but for one weekend there was a nice truce and some fun. “It was cool,” said Deng. “Not my type of game, but it’s fun. I played D like once. That was a good feeling not having to play D. Jo played his game. He played like how Jo played. He was having fun, got to know the guys a little bit. They got to know what Joakim is like. These never are much as far as games go with lots of lob dunks, the first being 16 seconds into the game with 71 threes shot. The West got 30 points from Kevin Durant, his third consecutive 30-plus All-Star game, and 20 points and 15 assists from MVP Chris Paul. Carmelo Anthony led the East with 26 points and 12 rebounds while Dwyane Wade added 21 points. There was a little bit of Michael Jordan inspired drama toward the end of the game on Jordan’s much celebrated 50th birthday. Jordan in the wake of the latest deification of James said in an interview to be broadcast Monday night on NBA TV that he’d take Kobe Bryant over James. Then Bryant blocked two James shots down the stretch to clinch the West win. It was the kind of response you’d imagine Jordan having in his day. So you say someone else is better? Watch this. It was as if Bryant was giving Jordan a bit of a nod for his support. Thanks, Mike. I’ll show you that your confidence wasn’t misplaced. Though I’m guessing James was glad to be going home. Jordan had been here earlier in the weekend for his birthday bash, and though he was celebrated throughout the weekend, his records continued to fall as Durant became the alltime All-Star leading average scorer moving ahead of James, who is now just 36 points overall behind Jordan’s total of All-Star points, which is second to Bryant. Bryant also tied Jordan for most steals in All-Star game history. Pretty soon, he’ll just be a pair of sneakers. These games pretty much are basketball beauty contests culminating a trade show weekend for the NBA for its sponsors and clients worldwide. It’s one reason why Chicago never gets one of these games. The Bulls don’t apply because the league takes all the tickets, meaning the season ticket fans and others are relegated to going to the All-Star Jam Session at some convention center. The rookie/sophomore game Friday is a tedious affair of slam dunks with players literally stepping out of the way on defense. Saturday night is the three-point and dunk contests, which are usually somewhat entertaining, though the stars rarely participate. The Cavs Kyrie Irving won the shooting contest with one of the best final rounds ever, and Toronto’s Terrence Ross won the dunk over Utah’s Jeremy Evans as both had some creative and theatrical offerings as Evans jumped over a picture of himself jumping over a picture of himself that he painted. As the old NBA marketing slogan went, these guys are good. Sunday’s game is the culmination of a busy weekend in which the players go through an endless gauntlet of NBA events, parties, sponsor obligations and family reunions. Then it’s a sort of mini Super Bowl with high priced halftime entertainment and various hip hop and rappers performing, though Gregg Popovich declined to name his favorite. While the NBA doesn’t have the Super Bowl’s intrigue about the commercials, the league came up with some entertaining personal player segments for the arena crowd in timeouts with players dancing or singing and being interviewed by two young kids, who pressed Garnett on whether his head looked more like a milk dud or an M&M. So, no it wasn’t about great basketball. It was also more a place to see and be seen. Though don’t tell that to Noah, who came out rebounding, challenging shots, boxing out and later in the game getting a bemused Paul on a switch and going into a deep defensive stance as Paul dancing at the three point line for a shot. Paul made the three late in the game for a 139-128 lead with 1:57 left before Bryant’s blocks would effectively end it. So as the exhibition became something of a game, as it does these days late in the fourth quarter, this time with the East getting within 127-124 with 4:24 left. It was Bryant rising up to make a block from behind on a James jumper. Durant grabbed the ball and dunked for a 10-point West lead with 2:34 left. James tried again, and this time Bryant got it from the front. “We were trying to win to get the money to pay for the weekend,” laughed Deng. It was a $50,000 winning team share for each player and $25,000 each for the losers. But this was just win/win for Noah and Deng this weekend in the company of the game’s best. For Noah, he can’t help himself but to play defense, run the court, compete, bother people, though he said his elbow to Paul’s head on the break after Paul hit that shot on him was purely accidental. Yes, he still wanted to win even this one. The Bulls pair came in with 3:53 left in the first, and Noah got that block on Randolph almost immediately as the West led 31-26 after one. If anyone suffered, it was Chris Bosh getting the start from East coach Erik Spoelstra for injured Rajon Rondo. Bosh’s first two shots were airballs, he was booed and sat down before long. In the second quarter, Noah ran a nice pick and roll with Paul George for a dunk, missed a tip and pleaded for a foul call, rebounded and went up twice and missed, pleading for a call again, something of an All-Star rarity. And when Jrue Holiday went up for a highlight dunk late Noah was up on the bench cheering and later greeted warmly by Garnett in a timeout when Noah came out. The West led 69-65 at halftime. Noah had that pick and roll dunk with James in the third quarter and then a crossover drive score by the new Iso Jo as the West went into the fourth quarter leading 108-104. And then with 2:33 left in the game, Spoelstra looked like he was trying to make one last run with the East down 10. He brought Noah back for Bosh and the East got within four late. 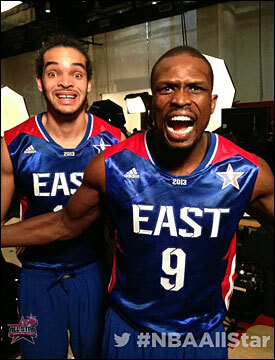 Though Noah and Deng looked like nothing but winners when it was over. “I enjoyed every minute,” said Noah.